WHY? Say 'No to Knives! '...Carrying a Knife in the belief that if will only be used to defend is 'foolish'. Many terrible injuries and fatalies have been caused when the persons own knife has been taken and used on them. To carry a knife is putting yourself and others in serious danger! Saying 'No to Knives! '...Carrying a Knife in the belief that if will only be used to defend is 'foolish'. 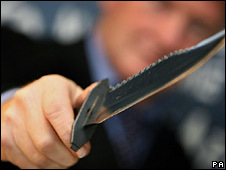 Many terrible injuries and fatalities have been caused when the persons own knife has been taken and used on them. To carry a knife is putting yourself and others in serious danger! ...I remember one Christmas Eve receiving a 17 year old male who had been stabbed in the chest on the left side. The knife had gone deep in to the chest, breaking 2 ribs in the process. He had a cardiac arrest on arrival. I opened his chest and attempted to stop the bleeding but there was no neat hole in the heart to sew up. Instead there was just a constant welling up of blood from behind the heart that flew out of the chest every time we ventilated his lungs. It was impossible to stop this...he died! Covered in blood, I looked up to see that it was now Christmas Day. The floor in the Resuscitation Room was about 1cm deep in blood and the place smelt of it! There was silence around the room. Later that night I found one of the nurses crying outside. The worst thing about this case is that the next Christmas Eve the same thing happened again". Mr. Nigel Tai, a Consultant in Trauma & Vascular Surgeon at the Royal London Hospital in Whitechapel has had ample opportunity to observe the tragic consequences of 'Knife violence' both in the UK and Abroad..."I will always remember breaking the news of one 17 year old victim's death to his Mother and Sister. The blade had gone in to his buttock and then in to an intestinal blood vessel, causing serious internal haemorrhage which resulted in his collapse, several hours later. Neither the Victim, the Perpetrator nor the Medical Staff realised the extent of the damage as the external wound was small and there was little bleeding!